I don't know if this link has been used on this thread already but here is a short video by David Daniels from Chick Publications (who gives a couple of shouts out to Steven Avery) that addresses the problem of staining of some of the pages and not others. Thanks. David has a number of superb videos on the topics. My take on what caused the different color of pages. The darkening of the pages could simply be water stains or accelerated darkening due to transferring the pages from a dry environment like St. Catherine to a more humid one. And 1844 pages in Leipzig is not a hot and dry desert, yet it did not have the proposed changes. And the hot and dry desert should have embrittled both sections, yet they are in "phenomenally good condition" with easy-peasy page turning as in the BBC video. In addition, what would happen that would colour ALL the pages that are 1859 British Library? And give them streaks and stains. One simple answer, sponge or light bathing in the proper solutions. That would also explain the unevenness of the pages in colour, and the fact that it does not have that built-in brittle yellow that is expected in ancient mss. Still very supple. I also find it troubling the way the current custodians of the Codex Sinaiticus handle such a so-called ancient document. They make allowances because they sense it is almost like-new. Nothing will rip or tear, the only real damage is what was done by their previous handling around some edges. Anyway, Daniels suspects some kind of chemical like coffee or tea was brushed onto the pages to make the pages look old. Oh, and in 1862-4, it was specifically pointed out that this was done in Sinai in the 1850s, with lemon water and herbs being mentioned as the agents. Either way, it does not matter for me because mass spectrometry testing can easily determine what caused the stains. I'm not sure about "easily", but I do tend to agree. The folks involved in the "Library of Stains" have not really looked into the deliberate stain issue, as far as I can tell. To not test the stains is highly suspicious and those who think the Codex Sinaiticus is a fraud are standing on firm ground on this one and should not be ridiculed as conspiracy theorists. The defenders of authenticity find "conspiracy theory" a convenient diversion from the real issues, and their lack of knowledge of the Sinaiticus history. This is a generalization, there are a couple of scholars who at least have some savvy and expertise in one or two of the important areas. Now as far as David Daniels idea as to what Tischendorf was up to and the hidden agenda of Westcott and Hort in completely changing the bible, I would like to hear more on that but on a separate thread. I sent the url of your post over to David, he was appreciative. LUL images use high contrast and very low color saturation. BL images use low contrast and very high color saturation. 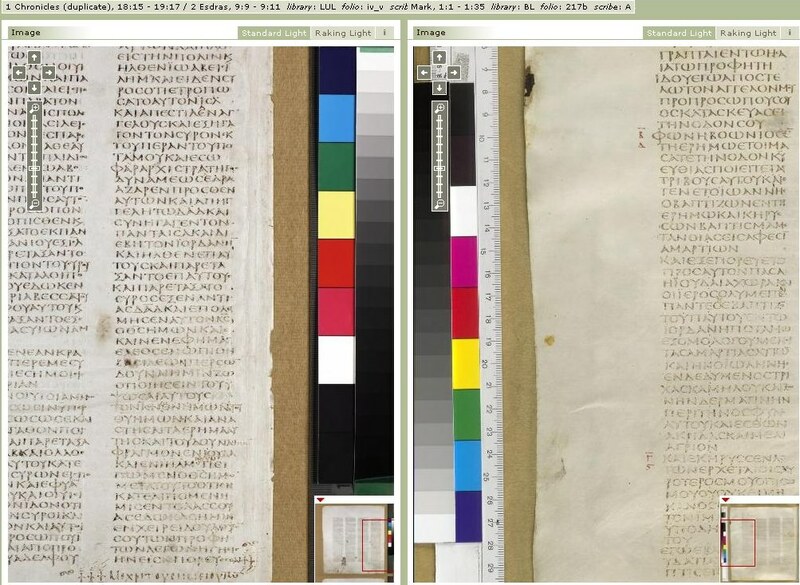 This easily explains why the Leipzig images look white with dark ink, while the BL images look yellow with colorful ink. The color and grayscale bars show the exact same differences. Even the pressboard backgrounds below the pages show the same differences. This means that much of this thread is a lot of noise about nothing. It probably also explains the reluctance of institutions to work with the people who promote this agenda. I still support calls for some attempts at a more reliable dating. It would be nice to have more reliably dated old Bible manuscripts other than Codex Fuldensis. Keep in mind though that, given the whole manuscript history as it has presented itself up to now, it remains very, very unlikely that we are looking at a 19th century forgery here. The points that new manuscript pieces that have shown up until 2009 in St. Catherine's are found in bindings of other books and that the manuscript was probably seen in the 18th century are the reasons why scholars pretty much dismiss any claim of this kind. Still, it would be nice to see how old the manuscript really is. At least the Leipzig leaves seem to have not been touched by half of the London population. That is the best excuse for not having a third party investigate the age of the ink? As far as how water can leave stains. If my memory serves me correct (probably not) didn't Tischendorf claim the Codex Sinaiticus was in a closet that was being cleaned out due to a roof leak from a recent rain storm? If so, that would explain why a stack of pages were darker than others. Pages at the the bottom of the closest that were temporarily submerged in a shallow pool of rain water would be expected to have a color change. That same thing happened to my comic book collection when I was a kid. I would have been a millionaire if the basement didn't flood. Reading comprehension much? Where do you see an excuse or a statement that nobody should do tests on the manuscript? I obviously stated that I'm all for tests. However, it's retarded to take colors in the images, be it the vellum or the ink, as true and base weird assumptions on these. It is as if people didn't know what internal standards are and what they are used for. I assume some people really have no clue about internal standards and why they are there, directly in the images. No reading comprehension problem on my part, lack of clarity in my statement, perhaps. My intent was, if that is the main excuse the owners of the Codex Sinaiticus are using for not testing the ink, then it is embarrassing and suspicious. But then again, you brought it up as if you think it is a legitimate excuse. So, if the shoe fits, wear it. Tell us, according to the owners of the Codex Sinaiticus, how does different lighting standards used for making photo images change the age of the ink to the point that radiocarbon dating and Mass spectrometry will be useless? My intent was, if that is the main excuse the owners of the Codex Sinaiticus are using for not testing the ink, then it is embarrassing and suspicious. Who claimed such a thing, and where? I don't have the slightest idea where you get such a statement from. The frustrating thing about talking with you is that you seem to constantly pull stuff out of your posterior in order to shoot it down. Whether it's reading comprehension or simple malice on your part is probably something you would have to ask yourself. But then again, you brought it up as if you think it is a legitimate excuse. So, if the shoe fits, wear it. What did I bring up? I was talking about what much of this thread is about: that the vellum colors of the Leipzig and the London parts of the Codex are supposedly different (that's actually the main topic of this thread), and that the color of the ink is supposedly somehow wrong. Both statements hang in the air. They are, at the moment, just baseless assertions from people who think that they look at true colors when they look at those online images on codexsinaiticus.org. That's my statement. where did I make the statement that those tests are useless? I would really like to have an exact quote from you now, given that you seem to be persistent regarding that weird claim. I never said you did but if you agree the excuse has merit you should own up to it or denounce it like me. Remember, you were the one that suggested that institutions probably are using it (the confusion regarding LUL images vs. BL images) as an excuse not to take the other questions brought up on this thread seriously. If so, that is most embarrassing for them not me. Let it go Ulan, let it go. I guess from time to time it's necessary in this thread to point out that the perceived color differences between the Leipzig University Library and British Library copies, which have been postulated in the thread title, are not really there. Various positions like this have been tried by a couple people, usually with vague assertions, and clearly fails. First, the difference visually is far greater than the color bars variance. Do your own checking in white, cream, yellow. Second, the British Library/CSP personnel have acknowledged that the Leipzig pages are "notable for their whiteness". b) large-scale variation in the 1859 British Library, uniformity in the uncoloured 1844 Leipzig. Also you have the "phenomenally good condition" of both parts. Here the BBC video is very helpful.Those claiming this is 4th-century have to ignore parchment ms. and ink science. Then you can simply corroborate the CSP off-white photographs with the pic of Ute Feller of Leipzig holding the ms.
And here you can see the British Library showing the contiguous pages. AM CORRECTION: The one on the left is St. Catherine's which has its own special history. Not Contiguous. British Library 1859 on the left, Leipzig 1844 on the right . "nothing to see here, folks, let's move on"
Last edited by Steven Avery on Thu Aug 02, 2018 5:21 am, edited 1 time in total. I thought I explained this seeming conundrum. I'm not the part of the institutions that have to make decisions like this. I have declared countless times in this thread that, personally, I am for all the testing you can do. It's not embarrassing, that's how human beings tick. As you can see from Steven Avery's posts, even in the last answers to me, scientists have shown to be very helpful on first contact. That's because they usually love the field they work in and probably find the question they are asked interesting and worthwhile. However, you can easily see how someone may lose their patience and come to the conclusion that they are not dealing with genuine interest but with a nutjob with an agenda (Steven being a KJVonlyist isn't exactly a secret). Then you look closely into the claims this person makes, the claims that fueled the inquiry in the first place, and the natural reaction is to just put a stop to it. The last thing you want in your professional career is to be associated with a band of lunatics. That's why I suggested that the push for more testing must come from a more neutral party. It may sound counterintuitive, but the activities of the group behind Steven may even prevent people from going along with testing at this point. Just look at Steve Avery's post above this. Honestly, what would you think of someone who uses that image of two successive online pages as a valid reason for suspicion of any kind. A "normal" person would just assume that the book had obviously fallen apart between those pages, and we still find parts of the Codex nowadays in vastly different locations in the St. Catherine's monastery (last find was 2009). You don't pick the worst example page to judge the parchment, you look for one that didn't fall into a puddle or lay under a leaky roof. I come here from time to time, and I see this Tibetan prayer wheel going on for years. From time to time, I call for a "stop and think". At least for a moment I'm sure I'm not deterring anyone, but maybe someone else who reads the thread doesn't swallow the story told herein hook, line and sinker.